After getting a thumbs up from Carolyn, who left a comment with her opinion on the Brownie Bark, I took her advice and tried making an oatmeal version. 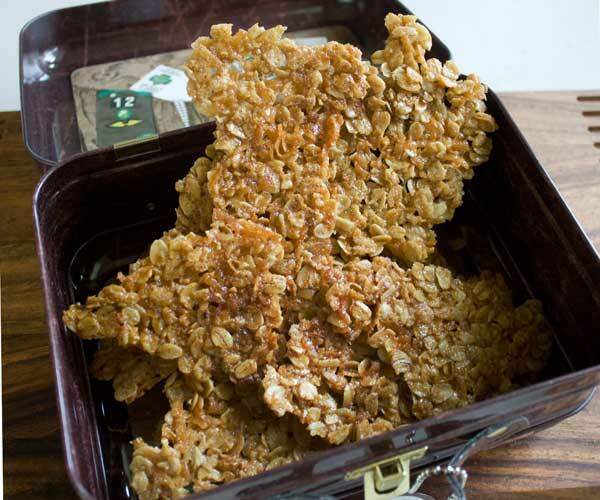 Definitely more of a brittle than a bark, this “oatmeal cookie brittle” is from the late Helen Corbitt. And for those of you limiting gluten, you’ll be happy to know it does not contain any flour. Helen Corbitt called this recipe “Oatmeal Crisps” and she somehow managed to cut it into “narrow fingers”. I’m still trying to figure out how she did that, because my batch went from being a bowl of soggy oats to a deliciously crisp slab that must be broken rather than cut. But hey, no big deal! Brittle was what I was going for, and this cookie definitely falls into that category. I didn’t think it would really become crisp since it was so wet coming out of the oven, but it did. It’s a buttery, crunchy, hard-to-stop-eating treat. Just make sure you have a tin nearby in case you have to hide it from yourself. A crisp slab of oatmeal cookie that you break into pieces. To make these gluten free, double check all ingredient lists and make sure the products you use are made in a gluten free zone. In a large bowl, stir together the butter, corn syrup, sugar, salt, vanilla and baking powder. Add the oats and coconut and stir until thorough mixed. Spread the mixture as thinly as you can across the baking sheet. Set in preheated oven and bake for about 20 minutes or until edges are browned. Let cool completely on a wire rack. When cool, the cookie should be perfectly crisp. Break it into pieces. I used unsalted, but the recipe just called for regular butter or shortening. I felt like the unsalted butter combined with the 1/4 teaspoon of salt that is already in the recipe was the perfect level of saltiness. If you used salted butter, you might get even better results. Gluten Free Vegan Chocolate Chip Cookie Cake or "Cookie Pizza"
« The Daily Cookie on Field and Feast! Hi Jessie, I always keep it in the freezer and am not sure how long it would stay fresh. Your best bet might be to go with peanut brittle or candy of some sort. Hi there! How long do you think these will keep for? I’d like to ship them across the country for the holidays. Do you think they could survive if well packed? And would they remain delicious? Thanks & can’t wait to try them! I used old fashioned but you could probably use quick cooking as well. Hello, should I be using quick oats for this or rolled (old fashioned oats)? These are FANTASTIC! I used a combination of large flake and quick cooking oats, so mine aren’t quite as lacy, I also used large flakes of shaved coconut. Next time around I’m making a double batch, one will have chocolate drizzled on it along with dried cherries and the second will have my oatmeal cookie spices mixed in. LOVE IT! very quick to make, economical and most people already have the ingredients on hand. I made this and we loved it. I liked it even better on Day 2 because I thought I could taste the coconut more. It’s addictive though! Hi, this is Angie from http://www.alilcountrysugar.blogspot.com. I just wanted to let you know that I am sponsoring your recipe in my menu plan today. This will be going in my Christmas gift boxes this year. I would say this was a hit in my house. I really didn’t expect it to be, as my family is very into chocolate and (other than me) they do not like coconut. However, I left the bark in a container on the table and the next day it was gone. I think I’ll experiment with it a little and slightly lower the amount of sugar. I’m wondering about replacing part of the butter with egg whites, but I wonder if that would totally change the texture? I figure I wouldn’t be wasting too expensive of ingredients to try that. Hi Anj, Thanks so much for trying it! It’s definitely perfect for the holidays. Anna: I tried this today. It is wonderful. I am definitely adding this to my Christmas goodie list. Thanks so much as always for great recipes. Carolyn, that’s great! I didn’t know Betty Crocker had an oatmeal bark, but it sounds good. From the picture, it looks like it could use some nuts or something to liven it up (other than chocolate). I’ve been working on one for the past few days, but I haven’t perfected it yet. Mine is more like a granola bark at this point. Thanks reviewing Helen Corbitt’s recipe, Jennifer. I totally agree with you about the nuts. They’d offset the sweetness a little, too. I made the recipe today. I did use salted butter and a scant 1/4 tsp of kosher salt and they don’t seem too salty. I don’t think I could have cut these into strips, either, so I just broke them into ragged sections. I kept the coconut in, even though my kids don’t like it, and they didn’t even notice it. Nuts, such as walnuts, might be a really good addition. Wow, this looks wonderful. I need to take a treat this weekend and this just might fill the bill. Wonder if some finely chopped pecans would work in there as well. I was all excited to make the brownie brittle and now this too!! THANK YOU!!! I can’t wait to finish work and other obligations today so I can go home and make this! I tried that while it was still. It separated a little and then ran back together. Maybe the trick is to do it while it’s warm rather than hot? I wonder if it would be easiest to cut the Oatmeal Brittle into “narrow fingers” with a pizza cutter (while still warm, as Martha suggested). Wow, this looks SO good! I could see it for breakfast! I am so pinning this to make later! Yikes — you’re killing me! This looks so good! The 8th grade bake sale is next weekend, and I am going to wow them with brownie brittle and oatmeal brittle (with proper attribution, of course!). I like Martha’s drizzled with chocolate idea. These sound tasty! This reminds me of Lace Cookies I used to make that were drizzled with chocolate. Maybe Helen cut them right out of the oven before they cooled. I have all of the ingredients for this & I’m tempted to try it today.